Cardiff is Europe's youngest capital city and is home to an enormous amount of urban regeneration and restoration - some of the biggest projects of their kind to be seen in Europe. Now ranking amongst the most fashionable cities in the United Kingdom, Cardiff has only actually been the capital of Wales for just over 50 years, and features chic and modern shopping centres, historic Victorian shopping arcades and world-class restaurants. Much of the city's focus has been diverted to the rather splendid Cardiff Bay, where waterfront restaurants, cafes, bars and shops are all enjoying the transformation of these former docklands. However, despite the many recent redevelopments, the city has managed to retain a huge amount of green space. Wood Street is where the city's main tourist information centre is located, close to the River Taff, the central railway station, the Millennium Stadium and the Cardiff Arms Park. 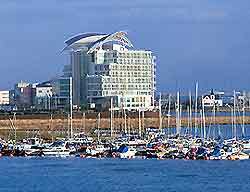 A relatively short distance to the east is the office of the Wales Tourist Board, which resides on Fitzalan Road, while further tourism outlets are to be found at the bay and also Cardiff International Airport. 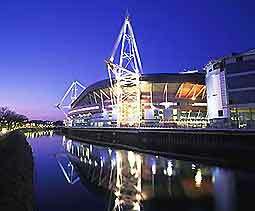 Although there are plenty of hotels in Cardiff, frequent major sporting events can greatly affect the availability of accommodation in the city. Many chain hotels are clustered in the city centre, on roads such as Bute Street, conveniently next to the Cardiff International Arena. Just across the River Taff and close to the Pontcanna Fields in Cathedral Road (off Dumfries Lane) are a number of budget hotels, which are around a 20-minute walk away from the centre itself. For luxury hotels in the city, consider staying at the circular Hilton next to Cardiff Arms Park, or at the waterfront St. David's Hotel, overlooking the bay. Popular tourist attractions include Cardiff Castle - one of the most visited sights in Wales with over 2,000 years of history within its walls; Castell Coch - the city's 'Red Castle' with fairytale round towers and red turrets; the Llandaff Cathedral - boasting the stunning 'Christ in Majesty' modern sculpture; the Mermaid Quay - with a particularly high concentration of entertainment venues; and Caerphilly Mountain - offering stunning panoramic views of both the city and the surrounding scenic Welsh countryside. Other attractions and major venues here include the Cardiff International Arena - a popular exhibition centre and concert hall, seating more than 5,000 people; the Civic Centre - an impressive, tree-lined area with white Portland stone buildings reflecting the wealth of historic coal and steel industries; City Hall - complete with a large and impressive domed roof, impressive architecture and a vast marble hall; St. David's Hall - one of the leading centres for musical excellence in the United Kingdom, hosting the world-famous annual BBC Cardiff Singer of the World competition; and the enormous Wales Millennium Centre - amongst the most impressive arts venues in the world, costing over £100 million to build, staging musicals, concerts and theatrical productions, seating in excess of 70,000 spectators. 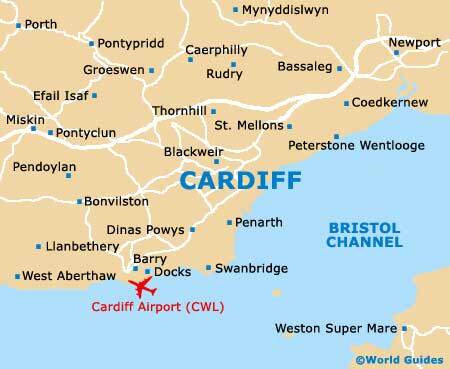 More information about Cardiff Tourist Attractions and Cardiff Landmarks. Cardiff also has a selection of museums, including the National Museum and Gallery - housing the largest collection of impressionist paintings in Europe outside of Paris, the fun-packed Techniquest Museum - an exciting, interactive science exhibition for all of the family, and the vast Museum of Welsh life - an open-air museum chronicling the history of Wales over 2,000 years, with endless information about the many old buildings that have been rebuilt on this site, after being relocated brick by brick. 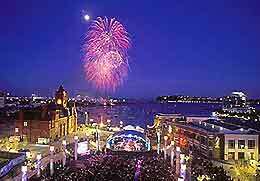 The Welsh capital is a popular destination to visit at any time of year, and this exciting Welsh capital has a year-long calendar of exciting, major sporting, musical and cultural events, such as the Cardiff Festival - attracting more than half a million people each year. With direct flights to Cardiff International Airport from many different destinations in Europe, the city is particularly busy during the summer months, when the weather can be extremely sunny. Many people now choose to travel here during the winter months, to enjoy the Christmas festivities and to make the most of the city's immense shopping precinct.